2.Perfect for Quick Repairs: Some repairs that common machines can not handle, like sewing curtains while on rod. 2.Use right hand to grasp the machine, put thumb on the top naturally, using your other fingers for support at the bottom. 3.Refer to image for threading direction. 4.Cloth placing: Uplift press plate, then place the prepared fabric under it, lightly put down the press plate to press the fabric. 5.Sewing operation: Hold cloth with left hand, deliver cloth mechanism automatically deliver fabric sewn out. Right shift machine, left shift fabric accordingly. 6.The machine can automatically let cloth enter and adjust stitch tension. 7.Replacing bobbin: Loosen nut and remove bobbin, insert extension spindle on bobbin shaft and slide thread spool in, secure thread spool with spindle cap. 8.Replacing needle: Loosen the screw and remove broken needle, then install new needle. 1.If you hadn't received or lost user manual, we will offer electronic edition immediately. 2.If you don't know how to use this sewing machine, we advise you could also search 'handle sewing machine'on Youtube. 3.If product you receive can't work smoothly or totally can't work, please contact us for replacement. 4.If machine can't make a knot, please keep patience and try again. 5.If the battery too hot, please stop working and wait a moment. 6.You can contact us freely for any questions. 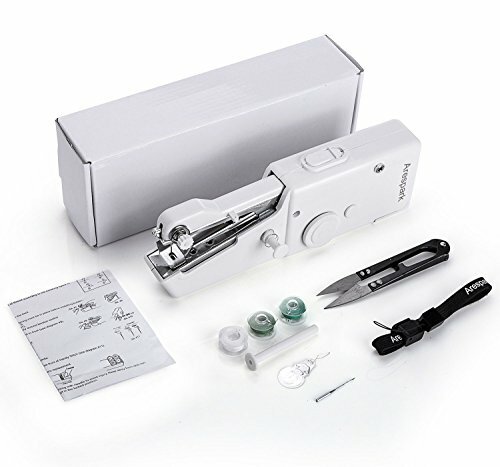 【Handheld Sewing Machine】: Portable and compact, excellent for on-the-spot repairs. It is a simple,convenient and practical quick stitch tool, easy to use and carry, fulfills your various sewing requirements in daily life. 【Perfect For Quick Repairs】: Some repairs that conventional desktop machines can not handle, like sewing curtains while on the rod, or mending a torn pocket without having to remove your pants. Can be seam thickness 1.8MM, too big, too hard, thick seam certainly not. 【Batteries Requires】: This sewing machine needs 4 AA batteries (not included). Cordless and battery powered our handheld sewing machine is the perfect companion for travel or home use. 【Perfect For Any Material】: Great for silks, denim, wool, leather and crafts. You can use it to sew hanging curtains, wall hanging, etc easily. 【Enjoy The Fun Of DIY】: It's funny to make your own handkerchief, apron, gloves, cloth with this practical machine,great for arts & crafts,patchwork,or simple embroidery. Ideal for both travel & home. Make sewing repairs anywhere. View More In Sewing Machines. If you have any questions about this product by Lypumso, contact us by completing and submitting the form below. If you are looking for a specif part number, please include it with your message.